To assess discrepancies in planned and delivered dose we conducted study in H and N cancer patients. In selected H and N patients during course of radiotherapy reimaging with repeat CT scan was done, after target delineation new plan was generated on repeat image. We compared two plans on repeat CT scan. The aim of the study was to show benefit of repeat CT scan and replanning in selected patients of H and N radiotherapy. A total of 15 patients of primary H and N cancer treated with IMRT technique from October 2012 to March 2014 were included in our study. We conducted prospective study by doing repeat CT scan and replanning in all the patients. Inclusion criteria were histologically proven squamous cell carcinoma in locally advanced primary H and N cancer. Patients with recurrent lesion, post operated, co-existing malignancies were excluded from study. Study was approved by clinical research and ethics committee. All patients underwent H and N immobilization using 4-clamp thermoplastic mask (Orfit) attached to the base plate using a positive fixation mechanism with four fixation points, two on either side of the head, and two on either side of the shoulders. Contrast enhanced CT scan were performed with 3 mm slice thickness from base of skull to the upper mediastinum. 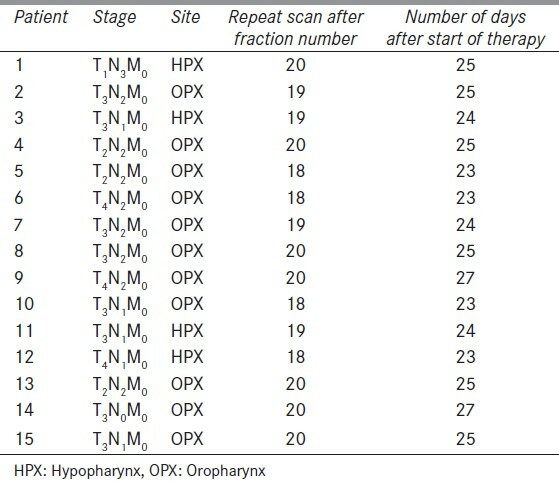 Eleven patients of oropharynx and four of hypopharynx were chosen for this study [Table 1]. Target volume and normal structures were contoured on each slice of CT scan. The gross tumor volume (GTV) represented visible tumor and/or enlarged or suspicious lymph nodes identified either clinically or radiographically with magnetic resonance imaging (MRI), CT and/or positron emission tomography (PET). The clinical target volumes (CTV) denote the demonstrated tumor and also volumes with subclinical tumor considered to need treatment (e.g., a margin around the GTV and regional lymph nodes not invaded clinically). Planning target volume (PTV) consists of the CTV and a margin to account for variations in size, shape, and position relative to the treatment beams. CTV 66 encompassed the pathologically involved tumor volume and nodes; CTV 54 was the clinically/pathologically negative anatomical regions at risk for microscopic disease determined by knowledge of the natural history of the disease. A 5 mm volumetric expansion was used to generate the PTV 66 and PTV 54 from the CTV 66 and CTV 54 , respectively. IMRT dose prescriptions were given for PTV and OARs. IMRT plans were generated and approved for each patient on treatment planning system Eclipse version 8.9 (Varian Medical Systems, Palo Alto, CA). 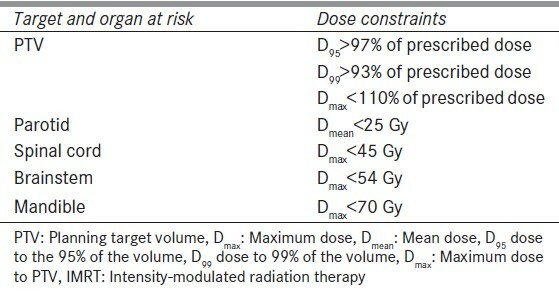 Dose constraints for target volume of IMRT planning used according to Radiation Therapy Oncology Group (RTOG) criteria and dose constraints for OARs were used according to Quantitative Analyses of Normal Tissue Effects in the Clinic (QUNTEC) as shown in [Table 2]. A repeat CT scan was acquired for each patient on basis of tumor regression (clinically, palpation) or weight loss after 3 rd week (between 18 to 20 fractions) of radiation. Because of weight loss, thermoplastic mould was no longer fit properly for six patients and new mould was made for immobilization before getting a repeat CTscan. Out of total 15 patients, 11 were of oropharynx and 4 were of hypopharynx. All patients were treated with concurrent chemotherapy platinum once weekly during radiotherapy 5-6 times. To eliminate interobserver variability, re-contouring of target volumes and OARs was performed by a single observer. Physician tried to maintain original target volumes during re-contouring to prevent underdosage of target volume. Volume changes were not that significant for normal structures like parotid, spinal cord, brain stem, and mandible between first and repeat CT. Changes in CTV 54 were done only based on anatomical changes visible in repeat scan and where target volume is adjacent to OARs. Two plans were generated on repeat scan for each patient. One actual plan (AP) which was generated by planning on repeat CT scan and another hybrid plan (HP) in which first IMRT plan (including monitoring units) was applied on repeat scan with carefully matched isocenter and bony landmarks. Isocenter matching was confirmed by Physician and Physicist. Plans on repeat scan were generated for remaining fractions. Dose volume histograms (DVH) of both plans on repeat CT scan were compared for volumetric and dosimetric parameters. Target volumes and normal tissue volumes (bilateral parotids, spinal cord, brain stem, and mandible) were compared between the first and repeat CT scans with a paired samples analysis. Accuracy of both the plans on repeat scan (AP and HP) were assessed on basis of PTV coverage and homogeneity and conformity index. The homogeneity index (HI) and the conformity index (CI) are two such objective tool to analyze the uniformity of dose distribution in the target volume. HI = D5/D95, where D5- dose to 5% volume of PTV, D95- dose to 95% volume of PTV. CI = (TV95/TV)(TV95/V95) where TV95- volume of target covered by 95% isodose line, TV- total target volume, V95- volume of tissue covered by 95% isodose line. Dosimetric comparisons ofboth plans were accounted for the remaining fractions of treatment. All the dosimetric comparisons were done only for PTV 54 and CTV 54 of AP and HP both. Comparisons between the paired CT volume measurements were obtained using a Wilcoxon signed-rank test. 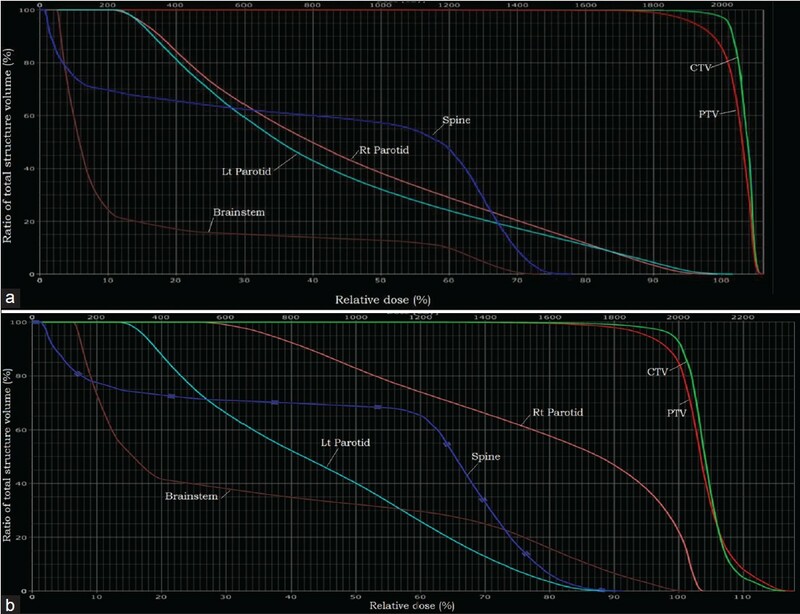 Comparisons between the actual and hybrid plan dosimetric parameters were carried out using the Mann Whitney U test. A probability value of less than 0.05 was considered significant. All statistical analyses were conducted using SPSS (originally Statistical Package for the Social Sciences) statistical software version 15. Weight loss in all patients on average was 10% (3-8 kgs) of initial weight and 6 patients required nasogastric tube for nutritional support. Volume changes were significant for GTV, CTV, and PTV. Mean decrease in volume of GTV, CTV 54 , and PTV 54 during repeat scan were 44.32 cc, 82.2 cc, and 149.83 cc, respectively as compared to first CT scan. [Figure 1] shows volume changes in first and repeat scan. Volume changes were not that significant for normal structures like parotid, spinal cord, brain stem, and mandible between first and repeat CT. Decrease in volume of right parotid, left parotid, spinal cord, and brainstem were 4.2 Gy, 4.8 Gy, 2.1 Gy, and 1.8 Gy, respectively in repeat CT. Mean conformity index and homogeneity index was 0.6 and 1.08, respectively for AP and 0.48 and 1.18, respectively for HP. [Table 3] shows mean increase in dose to OARs. There was statistically significant increase in D mean of right and left parotids in HP compared to AP. A 5.56 ± 4.99 Gy (P < 0.04) for right parotid and 3.28 ± 3.32 Gy (P = 0.03) for left parotid. D max of spinal cord also increased significantly in HP, 1.25 ± 2.14 Gy (P = 0.04) compared to AP. Increase in D max to brainstem was 3.88 ± 3.22 (P < 0.02). [Figure 2] shows isodose lines of dose distribution in both the plans AP and HP [Figure 3]. [Table 4] shows mean dose and coverage of PTV for both AP and HP. Mean dose to 99% of volume (D 99 ), mean dose to 95% volume (D 95 ), and maximum dose (D max ) reduced in HP. These findings are suggestive of that without replanning dosimetric difference in target volumes are significant. All the patients completed the prescribed treatment and there was no gap during the treatment. All patients developed grade 2 or 3 mucosal and skin reactions. None of them developed grade 3 or more reactions due to radiotherapy. Aim of our study was to detect influence of repeat CT scan and replanning on repeat scan during course of H and N IMRT. We assess two plans (AP and HP) for each patient for second half of treatment and it showed significant decrease in coverage of target volume (specifically PTV) if replanning would not have been done although sample size was small in our study but results were still statistically significant. It also showed increase in dose to normal structure. There are few studies on repeat scan and replanning in IMRT, ,,, and till date there is no criteria for repeat scan and replanning during radiotherapy. There are several reasons for changes during radiotherapy like set-up errors and anatomical changes. This can lead to incorrect low dosage to tumor and/or too high dose to normal surrounding tissues. , Set-up errors can be minimized by rigid patient immobilization and position correction based on X-ray and cone beam computed tomography (CBCT) images. These procedures are inadequate to account for geometrical errors due to changes of the patient's anatomy. To overcome these geometrical errors repeat imaging is necessary. Patients with a higher Body mass index (BMI) are more susceptible to changes in body weight during chemoradiotherapy (CRT) and consequently experience a greater reduction in CTV. Therefore, patients with BMI ≥25 should be recommended for repeat CT scanning and replanning. Beltran et al., suggested that patient weight may be a reliable parameter to detect changes in irradiated body areas in patients treated with IMRT. Weight loss is appreciable after the third week of RT treatment. The target coverage loss during the first part of the treatment, in which no significant target volume changes occurred, can be related to the anatomical changes observed (i.e., changes in the external volume). Schwartz et al. performed a prospective study of adaptive RT simultaneous integrated boost (SIB) method for 22 patients with H and N cancer, and demonstrated that one or two adaptive replanning could provide dosimetric and clinical benefit. Although one replanning was necessary for all patients, second replanning was necessary for 36% (8/22) of the patients. Significant anatomical changes occur during 3-4 weeks of treatment. The most significant volumetric changes and dosimetric alterations in the tumor volumes and organs at risk during a course of IMRT occur by week 2 of radiotherapy. In this study also, we found that maximum volume changes occur during the 3 rd and 4 th week. Barker et al. have found considerable volume reduction of the tumor in H and N during treatment. Additionally they found a shift in the center of mass of the tumor. A high correlation with the amount of tumor loss was found for theparotid glands. In our study, it showed considerable change in target volume changes but not significant change in normal structure volume. Hansen et al. focuses on the dosimetric impact of anatomical changes and when replanning and no replanning were compared, IMRT plans (without replanning) demonstrated reduced doses to target volumes and increased doses to critical structures. The doses to 95% (D95) of PTV were reduced in 92% of patients, which compromise the tumor control and also founddose to spinal cord and brain stem to increase during treatment. Capelle L et al. conducted prospective trial in 20 patients with mid treatment replanning in H and N cancer patients and concluded that there is minimal benefit to routine adaptive replanning in unselected patients, and no benefit in adjuvantly treated patients. In our study, we selected primary patients and replanning showed benefit. Advantage of replanning is to maintain accuracy of IMRT plans by achieving proper dosimetric parameters and dose to OARs which further reduces chances of late side effects of radiotherapy. Disadvantage is more time consuming, increase work load on physicist, physician and institute. Variations in patient positioning and anatomical changes during IMRT for H and N cancer can modify dosimetric parameters and may therefore have clinical implications on local control and toxicity. Repeat CT and replanning reduces the chance of discrepancies in delivered dose due to volume changes and also improves coverage to target volume and further reduces dose to organ at risk. Larger study with more sample size is required to set criteria of replanning. 1. Ozyigit G, Yang T, Chao KS. Intensity-modulated radiation therapy for head and neck cancer. Curr Treat Options Oncol 2004;5:3-9. 2. Hansen EK, Bucci MK, Quivey JM, Weinberg V, Xia P. Repeat CT imaging and replanning during the course of IMRT for head-and-neck cancer. Int J Radiat Oncol Biol Phys 2006;64:355-62. 3. Bhide SA, Davies M, Burke K, McNair HA, Hansen V, Barbachano Y, et al. Weekly volume and dosimetric changes during chemoradiotherapy with intensity-modulated radiation therapy for head and neck cancer: A prospective observational study. Int J Radiat Oncol Biol Phys 2010;76:1360-8. 4. Nishimura Y, Shibata T, Nakamatsu K, Kanamori S, Koike R, Okubo M, et al. A two-step intensity-modulated radiation therapy method for nasopharyngeal cancer: The Kinki University experience. Jpn J Clin Oncol 2010;40:130-8. 5. Cannon DM, Lee NY. 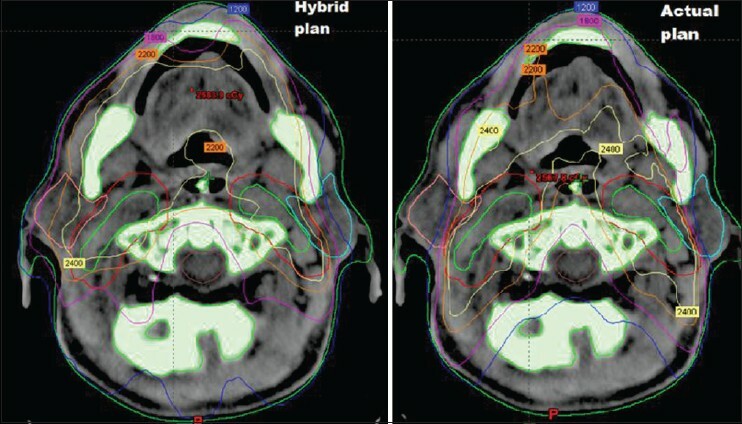 Recurrence in region of spared parotid gland after definitive intensity-modulated radiotherapy for head and neck cancer. Int J Radiat Oncol Biol Phys 2008;70:660-5. 6. Barker JL Jr, Garden AS, Ang KK, O'Daniel JC, Wang H, Court LE, et al. Quantification of volumetric and geometric changes occurring during fractionated radiotherapy for head-and neck cancer using an integrated CT/linear accelerator system. Int J Radiat Oncol Biol Phys 2004;59:960-70. 7. Nishi T, Nishimura Y, Shibata T, Tamura M, Nishiqaito N, Okumura M. Volume and dosimetric changes and initial clinical experience of a two-step adaptive intensity modulated radiation therapy (IMRT) scheme for head and neck cancer. Radiother Oncol 2013;106:85-9. 8. Wang W, Yang H, Hu W, Shan G, Ding W, Yu C, et al. Clinical study of the necessity of replanning before the 25 th fraction during the course of intensity-modulated radiotherapy for patients with nasopharyngeal carcinoma. Int J Radiat Oncol Biol Phys 2010;77:617-21. 9. Elstroem UV, Grau C. Adaptive image-guided radiotherapy for head and neck cancer. Functional Preservation and Quality of Life in Head and Neck Radiotherapy. Berlin Heidelberg: Springer; 2009. p. 183-90. 10. Yan D, Yan S, Wang Q, Liao X, Lu Z, Wang Y. Predictors for replanning in loco-regionally advanced nasopharyngeal carcinoma patients undergoing intensity-modulated radiation therapy: A prospective observational study. BMC Cancer 2013;13:548. 11. Beltran M, Ramos M, Rovira JJ, Perez-Hoyos S, Sancho M, Puertas E, et al. Dose variations in tumor volumes and organs at risk during IMRT for head-and-neck cancer. J Appl Clin Med Phys 2012;13:3723. 12. Schwartz DL, Garden AS, Thomas J, Chen Y, Zhang Y, Lewin J, et al. Adaptive radiotherapy for head-and neck cancer: Initial clinical outcomes from a prospective trial. Int J Radiat Oncol Biol Phys 2012;83:986-93. 13. Capelle L, Mackenzie M, Field C, Parliament M, Ghosh S, Scrimger R. Adaptive radiotherapy using helical tomotherapy for head and neck cancer in definitive and postoperative settings: Initial results. Clin Oncol (R Coll Radiol) 2012;24:208-15.